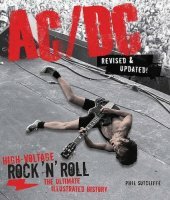 Another in the illustrated history series of big bands published by Voyageur Press is one about AC/DC. The book pretty much fulfils what is promised by the title – lots of photos and band artefacts and a well-paced history of the band. The story is well told about the youngest Youngs being mentored by George Young (who earlier found fame with The Easybeats) and their try-outs with multiple line-ups before a certain Bon Scott descended on them, and the rest is history. The slightly less told story of Brian Johnson is later picked up and the triumph and legacy of 'Back In Black' is given its full due. Great photos abound the book, as well as critical reviews of their albums and affairs are wrapped up and brought up to date with discussion about the recent 'Rock Or Bust' album.